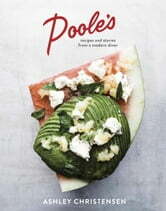 Poole’s is also the story of how Christensen opened a restaurant, and in the process energized Raleigh’s downtown. By fostering a network of farmers, cooks, and guests, and taking care of her people by feeding them well, she built a powerful community around the restaurant. The cookbook is infused with Christensen’s generous spirit and belief that great cooking is fundamental to good living. With abundant, dramatically beautiful photography and a luxe presentation, Poole’s is a landmark addition to the cookbook canon, a collection from which readers will cook and find inspiration, and pass down for generations to come.